Though I don’t have a musical bone in my body, I’ve been thinking recently about how to code statistical data about people into melodies. Now I find that there’s a whole industry out there of people who are turning DNA into music. If you know anything about your own DNA, you can plug your genes into a programme a play yourself. So maybe I do have music in my bones after all. 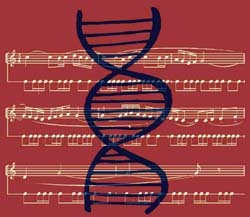 In English, the nucleotides Adenine, Cytosine, Uracil/Thymine, and Guanine are abbreviated with the letters A, C, T, and G. Since A, C, and G are also musical pitches in the Western melodic scale, these pitches were assigned to the matching nucleotides. To form two perfect fifths (C-G and D-A), “D” was arbitrarily assigned to musically represent Uracil. I assigned the pitches of the A minor scale to the amino acids based on their level of attraction to water. Question: would HIV sound different in a setting like Bali, which uses the seven-tone pelog scale? This post was published on 06/10/10 in Uncategorized. Tags: Art, DNA, HIV, music.